The summer is officially here! This is a time where drinks of all kinds are being abundantly consumed to battle the heat and stay hydrated. Many people tend to go for more refreshing beverages such as lemonade, pop, fruit juices, and electrolyte drinks. But while these may be refreshing in the moment, they aren't the best choices as they are typically riddled with sugar, which actually works against our bodies and can perpetuate dehydration. One of the best ways to stay cool, hydrated and nourished is to consume herbal iced teas - not the store-bought kind, but ones you can easily make at home with ingredients you can find at a Toronto naturopathic herbal dispensary. These not only taste great, they'll keep you cool and provide a plethora of essential vitamins and minerals to keep you hydrated and energetic in the energy-depleting heat. One of my favourite iced teas to make in the summer is made from hibiscus flowers. Hibiscus is a tasty and beautiful herb that can help us in many ways. It's extremely rich in vitamin C and antioxidants such as polyphenols like quercetin. It helps your body absorb B12 and provides a healthy amount of chromium, a mineral that helps regulate blood sugar levels. Hibiscus has been well-researched and found to help with maintaining healthy cholesterol and blood pressure levels. In Egypt, hibiscus is traditionally consumed to regulate body temperature, and for fluid balance. And, being in the middle of a desert, the Egyptians know a thing or two about staying cool in the heat. 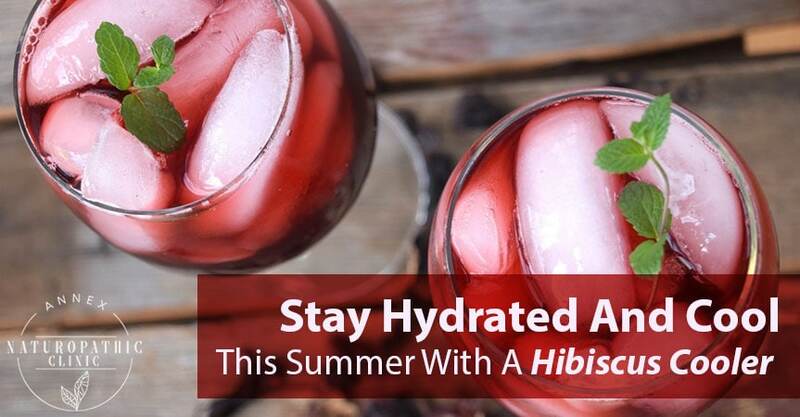 This makes hibiscus a pretty useful herb to drink during the summer heat. Making your own hibiscus iced tea is super easy. You can drink it on its own, but because of its potency some like to dilute it with sparkling water. You can also get creative with it and make some fun summer cocktails – I find it goes well with gin or vodka. Hibiscus is generally considered safe, but if you're on medication, it's best to consult with a healthcare provider who is familiar with drug-herb interactions before consumption. This might be the simplest recipe you can find – it only has two ingredients. Combine the hibiscus flowers to the cold water in a pitcher and let it steep in the refrigerator for about 8 hours. Strain out the flowers and enjoy the infusion over ice. It can be quite tart, so if that's not your thing you can always sweeten it with a bit of honey, or add some lime or lemon for a more citrus-y taste. 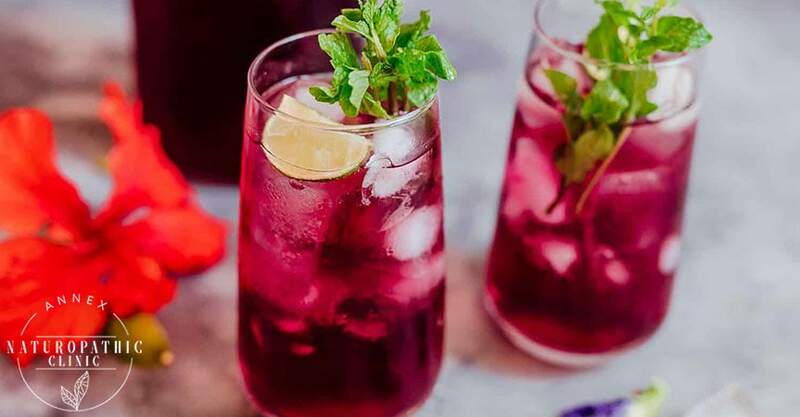 A hibiscus iced tea is a refreshing way to stay cool during the summer, but it's only the beginning. There are a number of different herbs with properties that can affect you, for better or worse, in many different ways. If you're dealing with some health concerns, we can help. Contact us here at Annex Naturopathic to book a consultation. We'll work with you to discover the root cause of your symptoms and develop a treatment plan with the goal of getting rid of them for good. Annex Naturopathic Clinic is a clinic in downtown Toronto that offers integrative healthcare solutions. Toronto naturopathic practitioners Dr. Marnie Luck, ND and Dr. Tanya Lee, ND offer a variety of treatment plans using a range of modalities individualized to each patient which can complement conventional health care.